Introducing Power BI publisher for Excel: sharing key Excel insights just got easier. Save snapshots of important PivotTables, Charts, cell ranges, and more from across all of your spreadsheets to a single location quickly. 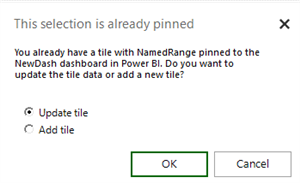 Share your Excel data to online dashboards in seconds: select an Excel element on the grid of an open worksheet and then click the Pin button on the Power BI ribbon tab. In the Pin to dashboard dialog, you can select an existing dashboard from a list of dashboards for which you have write permissions or you can create a new dashboard. Then click Pin to pin the element’s snapshot as a tile to the dashboard. Once pinned, users are presented with a confirmation message including a link to the new tile in the dashboard. When you select an Excel element that has already been pinned, you will be asked to choose if this is an update to the already pinned element, a new pin to the same dashboard, or a new pin to another dashboard. Users can review and update all pinned elements from an open worksheet through the list shown in Pin manager. The list consists of pinned elements on the open worksheet and their mapping to tiles on each dashboard it has been pinned to. 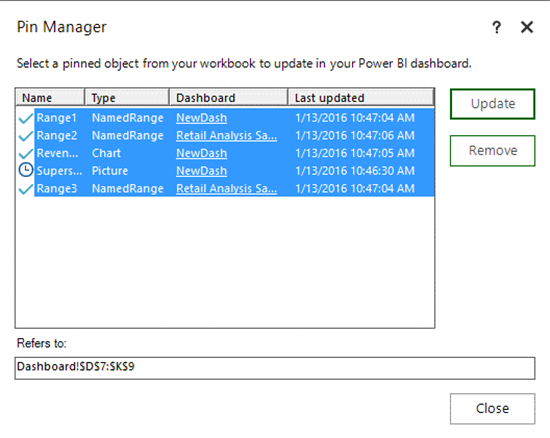 Power BI publisher for Excel supports updates of a single selection as well as updates of multiple elements. Highlighting a list item shows the pinned element selection on the Excel grid. Clicking the dashboard name link will open the associated dashboard in a browser. Users can remove a pin by using the Remove button. 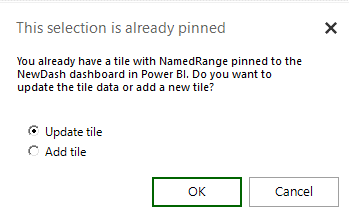 This is mostly useful when the tile had been deleted from the dashboard through Power BI or when the pinned element has been deleted from the worksheet. In both cases, you will get a notification icon with the relevant error. For each line with a message icon, warnings and error details will appear as a tooltip on hover. Note: in order to keep the Pin manager up-to-date and to support updates of pinned elements, the file must be saved after a Pin or Update operation has completed and before the file is closed. If you want to learn more about Power BI publisher for Excel, you can read our documentation.